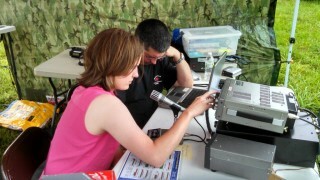 Hannah, KD5WNF, and Mike, AE5ZC, work on making another contact during Field Day 2014 operations of the Amateur Radio Club of the University of Arkansas. As per tradition, the club operated using the callsign K5GOE, which was previously the callsign of Dr. J.S. “Woody” Charlton (sk), long-time faculty advisor for the club. The Amateur Radio Club of the University of Arkansas (ARCUA) Field Day 2014 event took place at the Botanical Gardens of the Ozarks in Fayetteville, Arkansas on June 28-29, 2014. This was our third year to conduct Field Day operations at the Botanical Gardens. Although we had to take a brief break due to lightning in the area during the event, the weather was generally much cooler than usual, which was a welcome change from recent years. As with last year, station power was provided by batteries and solar panels only. While we opted to operate using “search-and-pounce” for much of the event, we had a number of students participate that had never done so before… which counts as a complete success from our viewpoint! 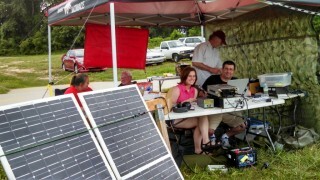 Another view of the ARCUA Field Day 2014 site in which the solar panels and battery are visible. At the operating table are Hannah, KD5WNF and Mike, AE5ZC. Standing just behind the table is ARCUA faculty advisor Larry, WJ5V. Behind the panels are ARCUA student president Jill, AC0MX and Robert, KC0GHY. [x2] All contacts were made using an output power less than 150 watts, thus we qualified for a power multiplier of 2. [+100] Power was provided by batteries that were charged by solar panels, as shown in the picture below. Thus, we operated completely off the grid and qualified for the 100% Emergency Power bonus. 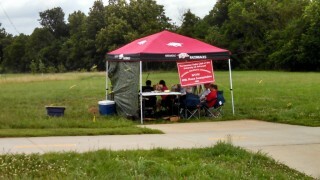 [+100] We setup our Field Day Event in a public area just south of the Botanical Garden of the Ozarks in Fayetteville, Arkansas; this location was adjacent to a public walking/bicycling trail. Thus, we qualified for the Set-up in a Public Place bonus. [+100] We setup a Public Information Table; thus, we qualified for this bonus(picture shown below). [+100] We received the W1AW Field Day Bulletin (copy below); thus we qualified for this bonus. [+100] An elected official, Kevin Thornton (K5KVN), visited our Field Day site. Kevin is an elected City Council member for Elm Springs, Arkansas. Thus, we were eligible for the Site Visitation by an elected government official bonus. [+100] We made at least five (5) QSOs without using power from commercial mains or a generator (actually, all of our QSOs were completed in this way). Therefore, we qualified for the Alternate Power bonus. A separate list of five QSOs that qualify for this bonus is provided below. [+50] Our Field Day entry was submitted using Web Submission; thus, we qualified for this bonus. Overall, then, our score was (2 x 300) + 650 = 1,250 points. The radio contacts that we made during the event (a.k.a., “QSOs”)are summarized below. Participants are listed alphabetically by callsign. Not everyone listed below operated; some assisted with setup or provided other auxiliary support. 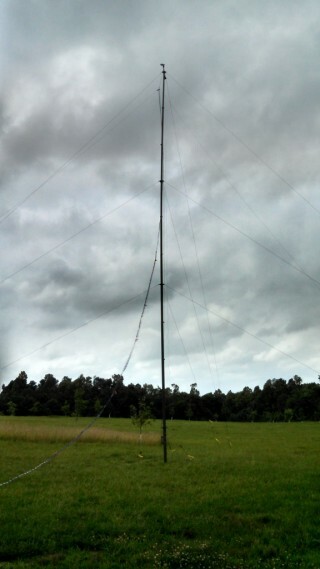 The Amateur Radio Club of the University of Arkansas Field Day 2014 antenna. A big “Thank you!” to everyone that participated with/supported us and/or visited us during the event. Everyone had a great time, and we’re already looking forward to next year!